How 5 friends were killed in Kaduna bloodbath - BlogIT with OLIVIA!!! 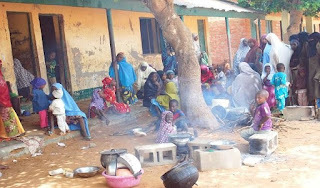 Residents of Gurguzu village, close to Maguzawa, a suburb of Rigasa in Igabi Local Government Area (LGA) of Kaduna State were on Monday thrown into confusion, when unidentified gunmen stormed a farm, killing five people and injuring six. The incident happened as the residents of the community were going about their normal daily activities. The gunmen, numbering five and riding on two motorcycles according to an eyewitness, came in search of the owner of the farm, Mustapha Abdulaziz, who was also among those killed by the gunmen. Abdulaziz was a staff of the Nigerian National Petroleum Corporation (NNPC) Minna depot. This was around six o’clock on Monday afternoon. Mustapha, Suleiman, Usman, Umar and Idris, all victims, lost their lives at the farm. It was gathered that hundreds of people from the village are presently displaced and taking refuge at a primary school in Rigasa for fear of being attacked by the gunmen. Another eyewitness, Alhaji Koko, who is a worker at the farm narrated his final moments with his late boss, saying that the gunmen covered their faces as they searched for his late boss. “On that fateful day, Mustapha, the manager of the farm, Umar Ahmed, and a friend of his called Suleiman Ishaq Suleiman, came to the farm. I was relaxing by a Shea Nut tree in the farm where we shared jokes and then I informed him that the maize we planted is not doing well. I asked him if he has cows and rams which he is rearing and he answered in the affirmative. I then advised him to bring a machete and some bags to cut down the maize and give to the animals, but he said that if we apply fertilizer to the maize, the crop will pick up,” Koko narrated. Koko and his employer went back and forth on the matter while the others watched in amusement. “After our discussion, Mustapha led his friend back to the farm house and told me he will bring a machete so that I can start cutting down the maize,” he said. After Koko said his four o’clock prayer, he decided to start the work before the bags and other equipment were brought. When the manager returned, he told Koko that Mustapha’s friend, Suleiman said his mind was not at ease and needed to leave the farm as soon as possible. Koko narrated: “The manager picked up the bags and handed over the machete to me. He had not walked thirty feet when I saw Alhaji Mustapha running in the sugar cane farm and soon there was a man chasing him with a gun. The stranger, with a scarf tied to his face, asked me in Hausa where the owner of the farm was and I pointed in a different direction. I have not seen someone holding a gun like that since the Biafran war. Even the police cannot boast of that type of gun.” He added that he quickly hid himself deep within the sugar cane farm and in less than five minutes heard several gunshots at the farmhouse. He heard voices, but when he called out, nobody answered. Koko had only seen one man with a gun, but said he heard other accounts that said there were five of them on motorcycles. He described late Mustapha as a hardworking, simple and caring person and prayed that Almighty Allah grant him paradise. Ardo explained that for the past three years they have been battling with attacks which always end before security agents arrive. Because the area is largely inaccessible due to bad roads and bushy landscape, the attackers are always successful. One of the displaced people, Hajiya Saudatu Mu’azu, said her own son was killed four months ago, also by unidentified gunmen, leaving behind two widows and 13 orphans. “They attacked our settlement, while trying to flee, one of my son’s wives was caught by the gunmen, so he went back to save her and that is when they shot and killed him,” she told Daily Trust. When Daily Trust visited the residence of late Idris in Rigasa, the tractor he was working with on the day of the incident was parked outside the house. His wives, Fatima and Nafisa, his eldest daughter, Zainab and other children were trying to hold back tears as sympathizers consoled them.